Happy Labor Day! 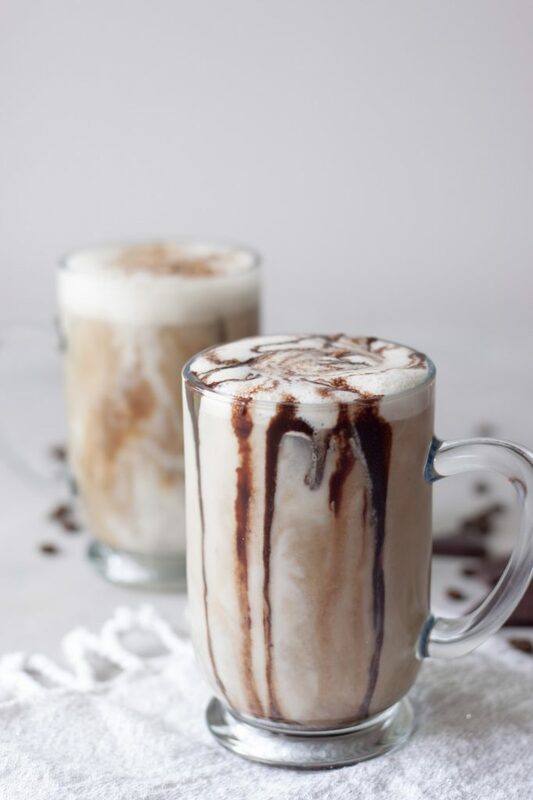 It also happens to be Meatless Monday and I have a quick and easy spin for you with an Iced Nana Mocha! Like the Iced Nana Latte I posted a couple weeks ago only with chocolate (how my husband prefers it)! I usually would put both into one post, which I did mention in the other but I’m really trying to keep things separate for SEO purposes (which really only matters in the internet and blog world and honestly wish I cared more about). In this case it works to my advantage because it’s a quick and easy post I can get up today without taking a lot of time away from the family. Since things have been so crazy the last couple weeks, and pretty much since May, I haven’t been able to schedule posts in advance and I’ve been doing many of them last minute soaking up as much time with the girls before they head back to school. While this isn’t a festive drink for Labor Day it is perfect for this week as the girls head back to school tomorrow and this mama needs all the coffee and help she can get! 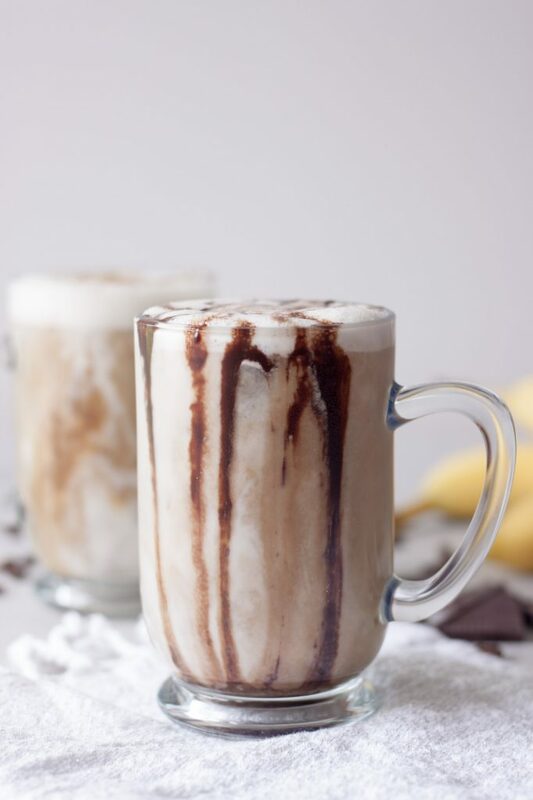 Not only trying to get up early and to barre before having to get the kids up for school, did I mention that an Iced Nana Latte is one of my favorite things to whip up before early morning barre classes? I know I did in that post but one of the best per workout snacks and perfect for mornings for me. So working out, getting the kids up, lunches made, get them to school, pick them up, gymnastics, dance, soccer, did I mention I also love an Iced Nana Latte for an afternoon pick me up? Yep sometimes in all the craziness I need something in the afternoon especially if we’re having a late dinner and I can sip this beauty in the school pick up line or on my way to getting the girls where they need to go. The crazy thing… I’m actually looking forward to them going back to school! Yes I will miss the heck out of them and I want them to stay home but I’m ready to get back into routine and with that hoping things calm down a little, wishful thinking! I can’t tell you how many times and ways I’ve enjoyed this Iced Nana Latte switching up milks, add-ins, ect. Even a Nitro Nana version using Calfia Farms Nitro Cold Brew or Mocha. While I love chocolate vanilla lattes are usually more my thing qne I whipped up this Iced Nana Mocha for my husband. However sometimes I need a little chocolate, yes need, and this is perfect! 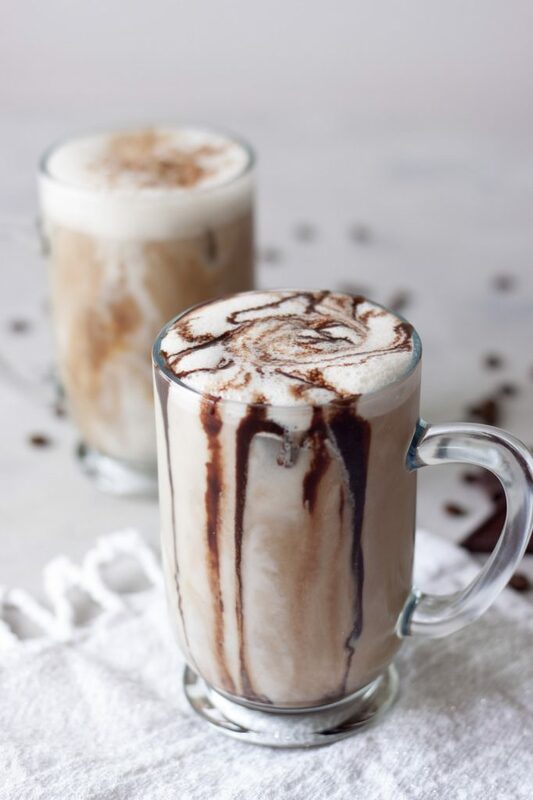 I posted my Iced Nana Lattes countless times on Instagram Stories, and even this Iced Nana Mocha, and after being asked for the recipe, and posting lots of recipes on there I decided it was time for a post. As I said there are a number of variations and I’ll try to get them all noted but it’s kind of like all the bullet proof coffee craze where everyone has their favorite version. I also vary it depending on what I have on hand and my needs. If I’m doing a longer workout I might add a little coconut oil or maca, if it’s in the afternoon as a pick me up maybe adding in a little collagen, reshi, or ashwagandha. Time of day I’ll vary the adaptogens I might add. Needing more protein I might make it with a protein milk like Ripple, or depending on what I have on hand and my mood I’ll use almond or coconut milk. For just a treat I may go with a Nana Nitro Cold Brew/Mocha version, using a thick and rich homemade milk, cold-pressed, or Toasted Coconut Coconut Almond Milk! Yes if you’re keeping up the options are endless! I would say deciding is usually the hardest thing but it really isn’t as I usually know what my body needs and what I want at the time. You may be thinking what coffee, chocolate, and bananas? Yes a little crazy but not really and not only does it give me energy for those early morning workouts but my tummy also handles it better than just grabbing coffee. Layering it makes it pretty and doesn’t really take extra time but if you’re in a hurry you can just blend it all together too instead of pouring your espresso or cold brew over top. So while I probably won’t be enjoying one of these today because I’ll be enjoying all the holiday and weekend eats and treats I’m pretty sure I’ll have one in hand tomorrow! If this doesn’t inspired you (I know coffee isn’t loved by all) I hope you are inspired by one of the many Meatless Monday recipes linked up below. If you have one to share my co-host Deborah and I would would love to see it and have you join us in the link-up below. Hope you all had a great weekend, if you’re off today you’re enjoying time with family and friends, and have an amazing week! 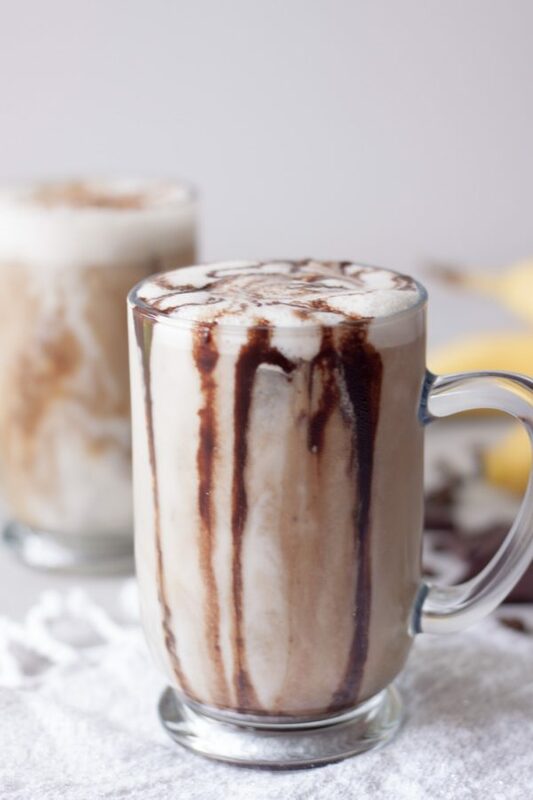 Delicious Iced Nana Mocha, is a creamy blend of banana, chocolate, and non dairy milk topped with espresso or cold brew for the ultimate treat. Great for pre-workout or an afternoon pick me up, adaptogen and sueprfood add-in options, and endless variations. To make a Iced Nana Nitro Cold Brew use 1/2 a frozen banana and pour Nitro Cold Brew (I like Calfia Farms) over top. 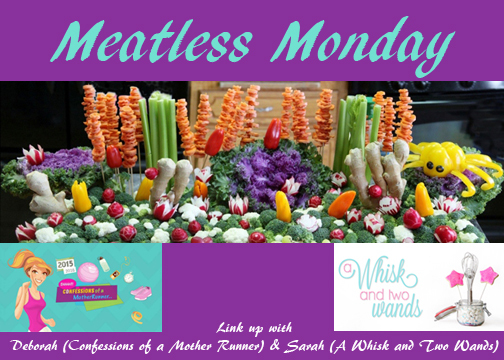 Also linking up with Annmarie from The Fit Foodie Mama and Dixya from Food, Pleasure & Health! Um…yum. This looks so good! Maybe I’ll give this a shot later today!! It reminds me of a shake. Happy Labor Day! What a heavenly idea – a “niced mocha” 🙂 Love it and so would my husband!